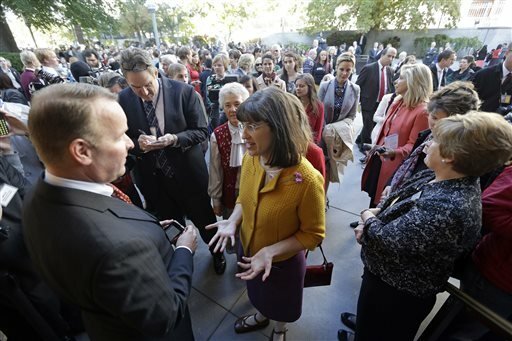 SALT LAKE CITY (AP) – On a day when the Mormon church announced its membership has hit 15 million _ a three-fold increase from three decades ago _ the ongoing debate about the role of women within the faith raged on. The Church of Jesus Christ of Latter-day Saints’ president Thomas S. Monson kicked off the two-day conference that brings 100,000 members to Salt Lake City by announcing the latest membership milestone from one of the fastest-growing churches in the world. Monson said the church was founded with 30 members in 1830, and that it took more than a century to hit 1 million. 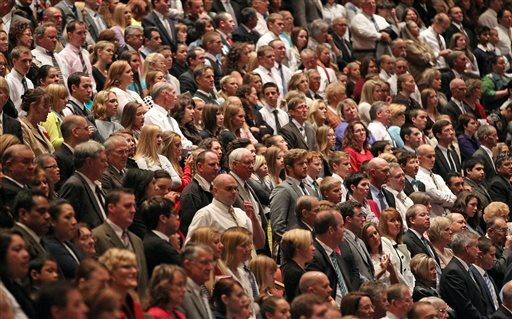 Church membership has tripled since 1982 when there were 5 million members, said Matt Martinich, a member of the LDS church who analyzes membership numbers with the nonprofit Cumorah Foundation. 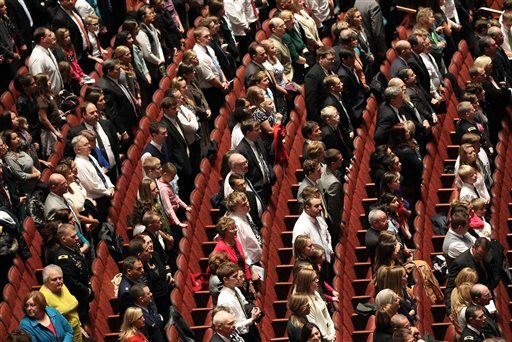 More than half of all Latter-day Saints live outside of the U.S., church figures show. Mormons are still vastly outnumbered by other religious denominations such as Catholics, 1.2 billion worldwide, and Muslims, 1.6 billion, according to data from the Pew Research Center. But the Mormon faith is also much younger than those churches, having been founded in 1830, and is among the fastest-growing churches in the world. In fact, the new Mormon membership figures suggest the religion has more members than Jews, who count about nearly 14 million members worldwide, Pew Research Center shows. Monson, considered the prophet of the church, said Saturday that there are now 80,000 missionaries around the world _ up from 58,500 a year ago. The historic growth was triggered by the church’s decision to lower the minimum age for missionaries, which Monson announced during this same conference a year ago. By allowing men to go at 18, instead of 19, and women at 19, instead of 21, a wave of new, younger missionaries have joined older ones that were already planning to go. The reaction from young Mormon women has been especially enthusiastic. The number of female missionaries has more than doubled in the last year to 19,000 currently, church figures show. 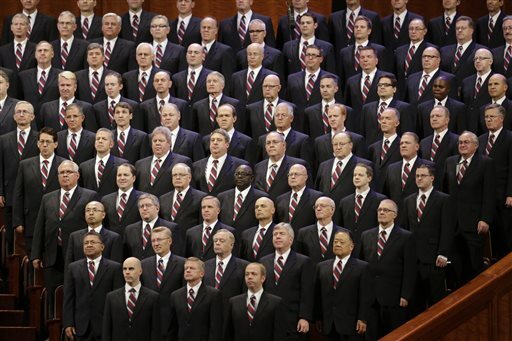 Many of the speeches come from the church’s Quorum of the Twelve Apostles, which is the second-highest governing body of the church. Modeled after Jesus Christ’s apostles, the twelve men serve under the church president and his two counselors. 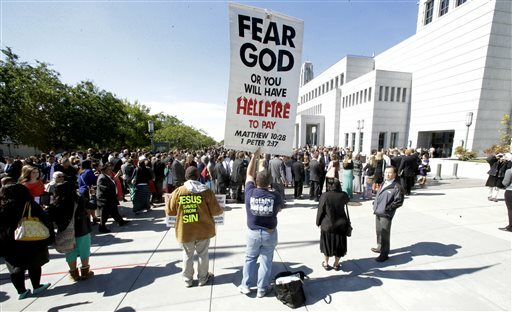 Quorum member David A. Bednar implored Mormons who don’t tithe 10 percent of their income to the church to seek forgiveness. “Please do not procrastinate the day of your repentance,” he said. Quorum member Robert D. Hales told church members Saturday that the “world is moving away from the Lord faster than ever” and instructed members to take the words of church leaders to heart. Dieter F. Uchtdorf, one of Monson’s two counselors, said wrestling with serious or sensitive questions about the faith is normal. But he said, “please first doubt your doubts, before you doubt your faith.” Speaking to those who have left the church, he invited them back in, saying there is always room for them. An afternoon speech by D. Todd Christofferson of the Quorum put the spotlight on the role of women in the faith a mere hours before a feminist women group called Ordain Women would ask to be let in an all-male priesthood meeting to highlight what they perceive as gender inequality. Christofferson said having women at home remains an essential part of society and cautioned against blurring feminine and masculine differences. He encouraged women to dress modestly, and be good and virtuous. “We have enough women of fame and fortune; we need more women of faith,” he said repeating what a former high-ranking woman in the church said. Earlier in the day, Carole M. Stephens, first counselor in the General Relief Society presidency, said both men and women are given “priesthood power” when they go to Mormon temples, but that the two genders have different gifts and strengths. Citing a bible verse, Stephens said the Lord’s plan emphasizes that men and women fulfill their responsibilities so that all may benefit. About 200 people joined the Ordain Women demonstration Saturday afternoon, marching from a nearby park to a standby line outside an all-male priesthood meeting only to be told again they wouldn’t be allowed in. Church spokeswoman Ruth Todd greeted the women and then delivered the bad news. She told them a similar meeting for women was held last weekend, and that the Saturday evening session was about “strengthening the men of our church.” The group had previously been denied their request for tickets. The women still stood in line with the hope that church leaders will recognize their commitment to the cause and pray for a revelation that would allow women in the church’s lay clergy. 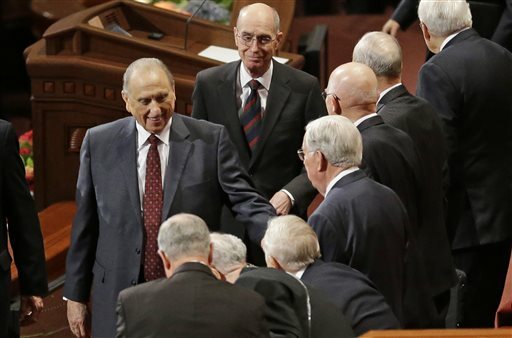 Women can hold many leadership positions in the LDS church, but they can’t be bishops of congregations or presidents of stakes, which include a dozen congregations. The all-male meeting was broadcast live around the world for all to see for the first time ever. Kate Kelly, the group’s founder, said that’s a good first step but not enough. Julia Murphy traveled from Germany to stand alongside the women. Even though they didn’t get in, she said it was another step in the movement.